Photo is of the Red Pheasant Rebels, the three-time defending champs in the men's recreational division at the Lawrence Weenie Cup. Though he’s busily preparing details for a hockey tournament this spring, Milton Tootoosis is also making plans for the 2020 edition of the event. Tootoosis is the tournament director of the Lawrence Weenie Cup, one of western Canada’s most popular First Nations hockey tournaments. The tourney is named in honour of Tootoosis’ late father Lawrence Weenie, who was known for his work announcing hockey games throughout Saskatchewan. Weenie, who was from the Poundmaker Cree Nation, was also heralded for his efforts in providing opportunities for Indigenous youth to get involved in various sports. This year’s Lawrence Weenie Cup, the 19th annual, is scheduled for April 5 to April 7 in North Battleford, Sask. Tootoosis is already thinking ahead to 2020 when the tournament will celebrate its 20th anniversary. He anticipates that will be much more than just a hockey event. The Lawrence Weenie Cup already features more than some on-ice hockey action. A singles 8-ball pool tournament was held in conjunction with the tournament last year. Tournament organizers have also added a talent show to this year’s festivities. One of the categories in the talent competition will be singing in an Indigenous language. “Our vision is changing somewhat,” Tootoosis said, adding organizers of the Lawrence Weenie Cup are hoping their event becomes a sporting and cultural must on calendars. Tootoosis said he’s inspired by the hugely successful Dakota Nation Winterfest held annually in Brandon, Man. Tootoosis has plenty of support organizing the Lawrence Weenie Cup. Tootoosis added the event helps instill wahkotowin, Cree for kinship. Since the tournament is named after his father, Tootoosis said he is recognized each year. Besides playing a key organizational role with the tournament, Tootoosis also plays in the event himself. Tootoosis, a goalie, has participated in all previous editions of the tourney except for one year when he was forced to the sidelines because of a groin injury. He’ll suit up for a team representing the Poundmaker Cree Nation in the men’s 45 and over category this year. Tootoosis, who lives in Saskatoon, has spent the past decade working as the director of livelihood and economic independence for the Office of the Treaty Commissioner. He works at a Saskatoon office. But he also frequently travels back to the Poundmaker Cree Nation. That’s because he’s also serving as a Headman (councilor) for his First Nation, as he was elected to a four-year term during the spring of 2016. The Poundmaker Cree Nation is about a two-hour drive from Saskatoon. As for this year’s Lawrence Weenie Cup, it will feature five divisions. The senior recreational division, for men ages 18 and up, is the highest calibre grouping. There are also men’s over 35 and over 45 divisions. Organizers are hoping to run a women’s category, as well as a male Midget (for those ages 16 and 17) division. Tootoosis is keen to see the women’s division added this year. A total of 26 clubs competed in the tournament in each of the past two years. Tootoosis is hoping to set a new record of having at least 28 participating squads this April. Saskatchewan’s Red Pheasant Rebels are the three-time defending champions in the senior recreational category. 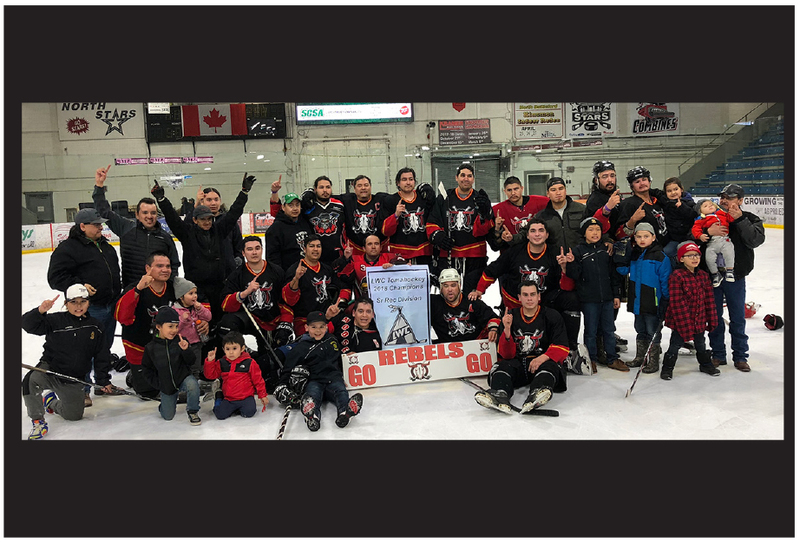 The Rebels will be seeking yet another championship at this year’s tournament.